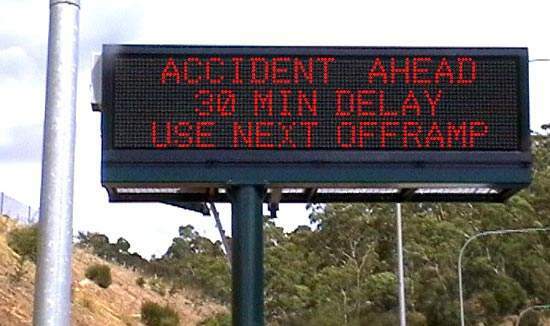 A VMS (Variable Message Sign) controlled by traffic operations at Transport SA, Norwood. A CMS (Changeable Message Sign) in normal green mode can instantly be changed to feature caution or warning signs. The twin tunnels of the Adelaide-Crafers Highway are a fantastic civil engineering achievement. 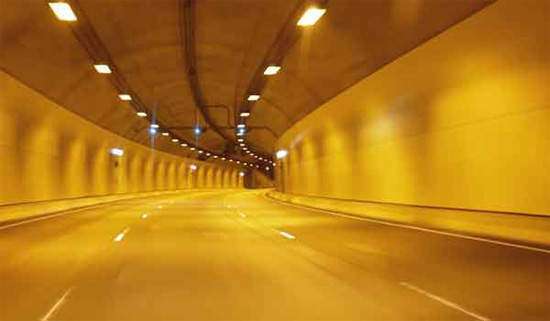 Inside each tunnel has three wide lanes and state-of-the-art safety equipment. 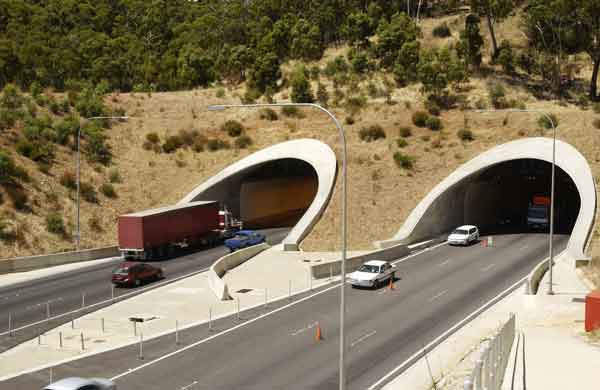 The twin Heysen tunnels were the first of their kind on the M1. The highway opened in March 2000 and has been a great success in reducing the commuting times of 30,000 vehicles each day. The 10km Adelaide Crafers Highway was one of South Australia’s largest road projects and now provides first-class driving conditions for heavy freight operators and regular commuters. 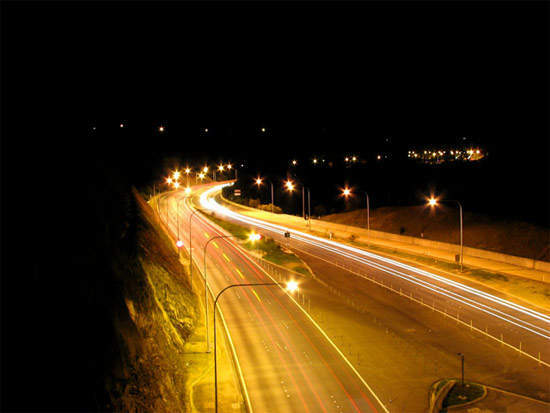 It is also a magnificent gateway to Adelaide for travellers arriving from Australia’s eastern states; it links Adelaide to Crafers in the Adelaide Hills and then continues from Crafers as the South Eastern Freeway. 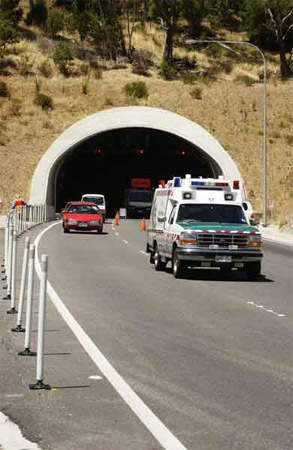 The highway features the 500m-long Heysen tunnels, named after Hans Heysen, a well-known South Australian artist and the first twin-tube tunnels on the M1 National Highway. The project, which was first announced in 1995, was entirely funded by the Australian Federal Government under the National Highways programme. 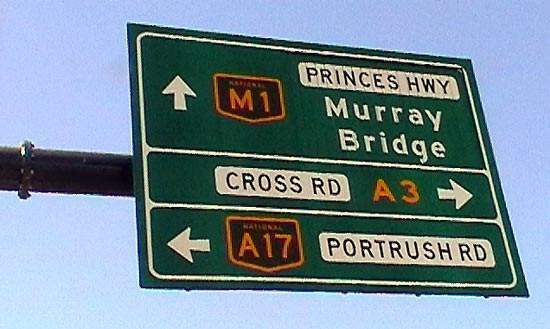 The highway, which cost AU$151m, was opened by the Prime Minister John Howard in March 2000. The project transformed one of the most dangerous sections of the Australian National Highway into a super-safe highway; previously, the Mount Barker road with the tight hairpin bend known as the ‘Devils Elbow’ led to many accidents. The Adelaide Crafers Highway has now cut 2km from the daily commute between the Adelaide Hills and the city for more than 30,000 road users. colourful bus shelters and extensive designer landscaping. The highway features six lanes of traffic with arrester beds in case of brake failure from heavy vehicles, concrete median barriers and lighting along the whole length. Transport South Australia supported the implementation of an Advanced Traffic Management System (ATMS), interoperable with their current Traffic Management System. It monitors the Variable Speed Limit Signs (VSLS), Variable Message Signs (VMS), Changeable Message Signs (CMS) and video coverage along the length of the new section of the highway. The traffic management and surveillance system includes cameras, infrared tall vehicle detectors and signs, lane use signals and tunnel control systems. The CMS were introduced at every 200m in 2005. The VMS can display any combination of text and/or graphics and are located at the approaches to both tunnels. In the event of an incident, the VMS (which are controlled by the traffic operations at Transport SA, Norwood) warn motorists of any hazards ahead and will direct or stop traffic as necessary. The CMS along the highway can show three different messages. In normal traffic conditions, the signs are green and display the distances to towns and turn-off information. In the event of a hazard further along the highway, they can instantly be changed to either yellow caution or red warning signs, complete with appropriate driver instructions. The innovative CMS are supported along the length of the highway by standard, large, fixed signs indicating approaching exits. CMS allow the speed limit of the road to be adjusted from Transport SA headquarters in Adelaide. When the new highway first opened there were several accidents involving articulated lorries. The drivers of heavy vehicles being unused to the new stretch of road were unable to brake in time and consequently there were problems. The VMS helped the situation, allowing lorries to take more care on the descent. The contractors on the Adelaide Crafer Highway were Macmahon Walter Construction, in a joint venture with Maunsell Mcintyre Pty Ltd. SMEC Australia and Transport SA were responsible for the entire project, combining engineering mastery with a strong sense of aesthetics. AD Engineering Pty Ltd contributed to the design and manufacturing of the ATMS, VMS, CMS, video coverage and height detection system. The company also provided power, emergency telephones and fibre optics along the length of the new section of the highway. In 1996 a pilot tunnel was cut under Eagle on the Hill to provide additional information for design, construction and planning. The pilot tunnel was then later excavated as part of the Adelaide-heading Heysen tunnel. Work was started in the fourth quarter of 1996 to construct a temporary diversion of 2.5km of roads at Crafers, which were then opened in February 1998. In the fourth quarter of 1997 construction of a 1.7km diversion road from Mira Monte Estate to Mt Osmond Road was finished. The three-lane road incorporating sections of the final road ran around the hillside at the new road level. The old road was finally filled to a depth of up to 12m to allow completion of the new six-lane asphalt paved highway. The extra width and higher level provides the new road with a wide and smooth elevation alignment to and from the tunnels. In August 1998 workers cut through the Adelaide-bound tunnel and in September cut through the Crafers-bound tunnel.